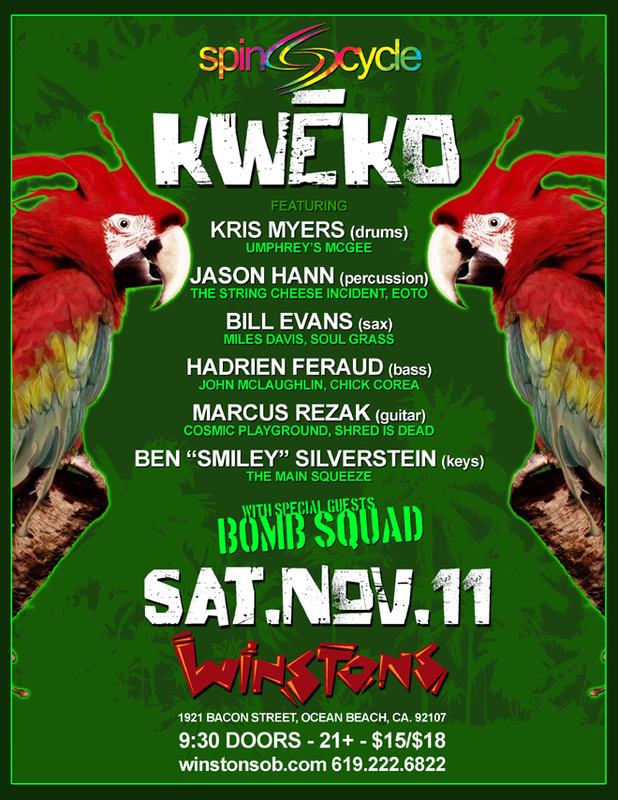 WITH SPECIAL GUESTS: Bomb Squad!!! Winstons is an intimate venue. Many shows have reached capacity in the past. Save a few bucks and get your advanced tix today, before they’re sold out! Come enjoy a COLLOSAL lineup of world-class musician when these fantastic players join forces, for two nights only, to supply listeners an incredible musical experience. This is a TOP-NOTCH Super Jam with ALL-STAR players from both the jazz and jam worlds. Kwēko will play 2 sets. The first, covering tunes by some of our favorite artists from contemporaries like jazz/fusion artists The Bad Plus, Weather Report, Tribal Tech, Herbie Hancock, Kenny Garrett, as well as a twist of Radiohead, Tame Impala, Arcade Fire, Death Cab for Cutie, and other Alt Pop pioneers. kwēko will also feature some originals from various band members to keep things on point! This eclectic mix of music will be played to the highest level of artistry and musical magnetism! The night kicks off at 9:30pm with Bomb Squad, a hard hitting San Diego funk act that always brings the party! Kris Myers has made a name for himself rocking the drum kit with progressive rock band Umphrey’s McGee for over 14 years. Known for his impeccable precision and jazz style, there’s no genre Kris can’t play. Myers has performed at legendary festivals and such as Bonnaroo, Lollapalooza, Austin City Limits, Fuji Rock Festival, South by Southwest, Red Rocks, The Beacon Theatre, The Ryman Theatre, and more during his tenure with Umphrey’s McGee. Kris has shared the stage with some of the best musicians in the world including Buddy Guy, Huey Lewis, Les Claypool, Stephen Perkins, Joshua Redman, Taj Mahal, Bela Fleck, Gene Ween, and Victor Wooten. When not on tour, Kris currently plays in various projects with Mike Keneally, Kick the Cat, and Adrian Belew. He is also a co-owner of a publishing company called Goodnight Nurse Publishing. Percussionist Jason Hann, most known for his work with String Cheese Incident and the electronic duo, EOTO, uses a full palate of rhythms and sonic textures fromaround the planet to express his voice to any project he dives into. Having studied folkloric music in Mali, Ghana, and Korea - and including otherstudies in Indian, Cuban, Brazilian, Senegalese, Malinke, and Middle Eastern music and performing in countless performances and recordings - and whose resume includes artists as diverse as Dr Dre, Isaac Hayes, Mickey Hart, Lorena McKinnett, and Ricki Lee Jones - Jason presents a unique, tasteful, and creative approach to any musical setting. Bill Evans (saxophonist) is a world-class, Grammy® Award winning saxophonist, singer, and producer who made his debut on the international music scene in the 1980′s, at the tender age of 21, with Miles Davis – yes, the Miles Davis. Bill has been very prolific in the studio, recording 25 solo albums to date. You may have seen him walk on stage as a guest with the Allman Brothers or rock out with Warren Haynes & Gov’t Mule. He also tours Europe with the “ Bill Evans Band “ and co-leads a tour with Mike Stern. Bill has been a special guest with Phil Lesh, Medeski Martin and Wood, and countless others. This past year, the “Bill Evans Band” has toured Japan, Australia, Europe, and India. His latest 2016 release “Rise Above” features vocals by Anders Osborne, Warren Haynes, and Greg Allman for starters. Marcus Rezak has been busy rocking shows all summer long and is currently recording with Mike Garson, keyboardist with David Bowie. Rezak is a busy guitarist and versatile composer performing and recording all over the USA in 2017. Some of Marcus’ projects include: Cosmik Playground ft. Arthur Barrow, Chad Wackerman, and Robert Martin, who are original members of Frank Zappas band; Katharsis ft. members of Motet, Dopapod, and RAQ who just released a new album and tour dates. Plus, a fierce instrumental Grateful Dead group called Shred is Dead who recently opened for Melvin Seals and Jerry Garcia Band at Saint Rocke in Hermosa Beach. The group includes some world class players such as Grammy award winning drummer, Raul Pineda (Chucho Valdez). Ben Smiley Silverstein is the keyboard player and one of the founding members of the LA based rock band, The Main Squeeze. After forming the group in 2010, the Squeeze has been on the road building their fanbase from the ground up, while honing in on their studio sound. Some of the Main Squeeze's accomplishments include winning an international Jazz and Blues competition in Macau China for $32,000 and recently recording a full album produced by Randy Jackson. When Smiley isn't on the road with The Main Squeeze, he is writing and producing for several up and coming artists in LA. Hadrien Feraud was born in august 84 in Paris. he spent the first years of his life in a family where music plays a very important role. His parents who are musicians, turned him very young into various musical styles: rock',pop, blues, funk ,old school R’n‘B, new wave, traditional, jazz etc…. Bomb Squad is a hard-hitting, aggressive, in-your-face funk trio that brings a party to the stage every time they play. Coming together from different cultural backgrounds, each member contributes a unique flavor to the sound of the band. Guitarist Ricky Giordano adds a heavy rock edge to organist Tonga Ross-Ma'u's modern jazz approach. With drummer Tim Newton's gospel and R&B background, he provides a foundation with deep grooves and captivating rhythms. His ability to stretch out and express himself through creative drum solos and collective improvisations with the band, is the most exciting part of Bomb Squad's live performance.